My last blogpost about my recent thoughts on life and creativity helped me to put a new spin in my writing and photography endeavours. I have a little notebook where months ago I started scribbling down ideas, recipes I wanted to share with you and themes I would have loved to talk about. Pulses were among the first themes that joined that list, as they are basic pantry staple ingredients, protagonists of traditional recipes, part of my family gastronomical traditions and, more than other foods in the world, they can be delicious. FAO also declared 2016 the International Year of Pulses. A few months ago I was contacted by Amio for an interesting project: they asked me to develop recipes with pulses for their website. It was not a traditional request, not simple how-to solutions, but fully researched recipes, which need do be easy to make and appetizing, step-by-step photos, sheer freedom in photography and writing style. This is the kind of collaboration that excites me, that fills my stomach with buzzing butterflies. 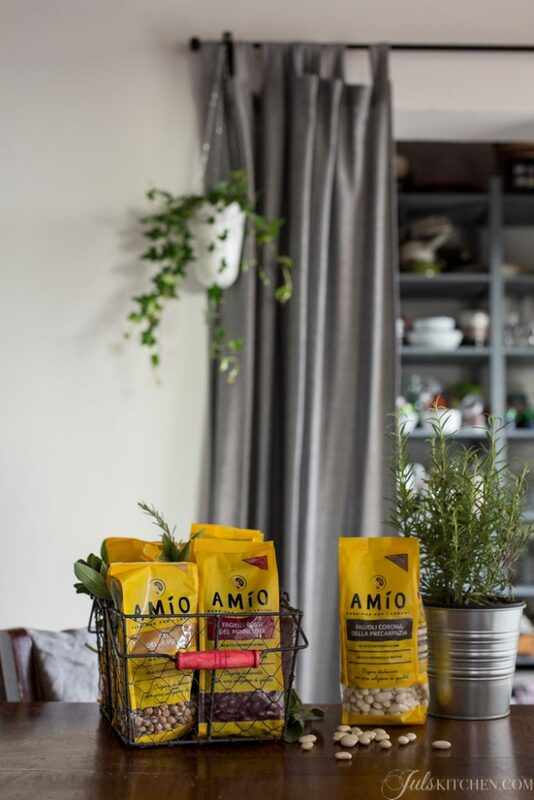 Trust, creative freedom and high quality ingredients, as Amio has been researching the best pulses all over the world for more than forty years. You can easily imagine how excited I was when I finally managed to organize my schedule and carve out time for a new exciting project like this one. You’ll be able to read my recipes on Amio Daily Pulses from December. I won’t be alone in this journey, as you’ll also find beautifully photographed recipes and stories by Valentina and Zaira. But back to pulses. A few months ago I listened to a very interesting podcast from BBC Radio 4 – Food Program (my favourite podcast ever, you should listen to the episode on pizza), Raising the pulse, which opened my eyes on the importance of beans for humankind. Pulses are the oldest and most global of our food, as legumes existed everywhere there were people. They were fundamental for the world’s greatest civilizations, as they make famine less probable: they are affordable and support human beings when other crop fails. Have you ever tried to feed a family with 2 euros of beans or 2 euros of meat? In the first case they will left the table happy and rolling. 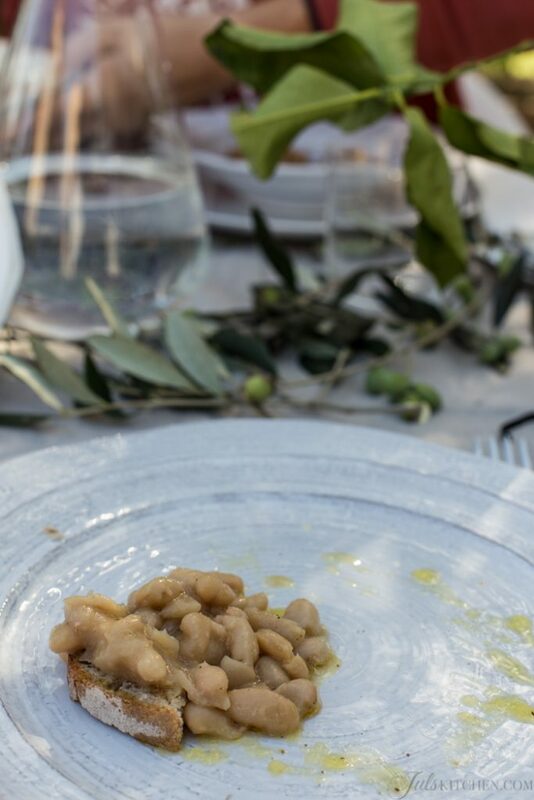 Don Saladino also underlines how many exciting food cultures are dependent on pulses, mentioning Tuscany and how we usually define Florentine people, mangiafagioli, bean eaters. Beans can be a source of pride and identity. Ribollita is a dish many Florentines would proudly fight for, as it the quintessential Tuscan winter food: it shows the imaginative use of stale bread, it testifies our love for beans, promoted to main course and not relegated to simple side dish, it gives the cavolo nero a chance to shine through as traditional winter green but, mostly, it comforts you as a soft blanket on a cold night or your grandma’s hug. In my family beans and chickpeas are part of the encoded traditions passed on from generation to generation. There are rules that must be respected, which call for rosemary with chickpeas and sage with beans. Do not dare cook them differently. 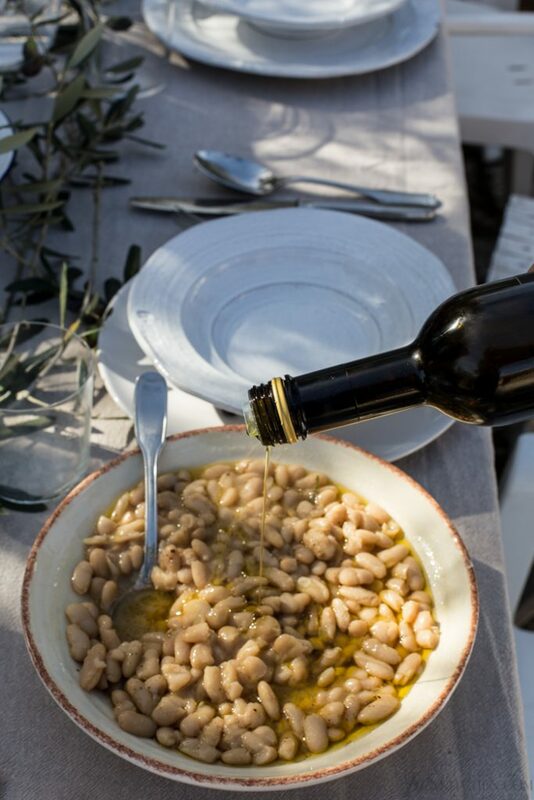 Thus, you will find some rosemary needles floating in our passato di ceci, a velvety and comforting chickpea soup, while a few crisp sage leaves will match beans and sausages in a traditional winter dish, fagioli all’uccelleto. Pulses are also food to celebrate togetherness and seasonality. 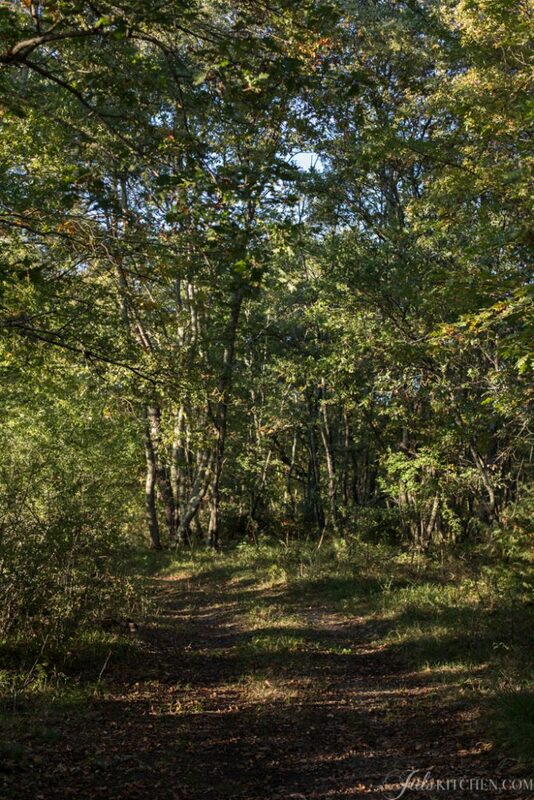 Our first Three Acres Gathering just ended. During one of our meals we served a bowl of beans cooked overnight in the wood fired oven. We toasted some bread – not an average bread but the fragrant sourdough loaf made by Manuela the day before -, rubbed it with garlic and topped it with a spoonful of creamy beans. Oh, the richness of a bowl of bean cooked al fiasco, or in the oven, and seasoned just with the best extra virgin olive oil, salt and black pepper. A few paper thin rounds of fresh onion are the only addition allowed. Nowadays pulse consumption as gone down, people do not realize how affordable, versatile, good for them and the planet, sustainable they are. Pulses are also farmers’ friends, as they enrich the soil, fixing nitrogen back into the soil. We need to revaluate how delicious they can be. In the past pulses were considered food for poor people, eating beans was a social stigma, as you could not afford the most precious meat. But pulses are the key ingredients of some of the richest and most comforting dishes in the world. 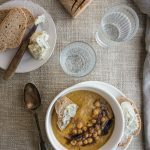 Last year I found myself with a bowl of cold chickpeas and some butternut squash which screamed to be used as soon as possible. They married in a thick soup tinted in autumnal colours and since then this has been my go to meal when I’m in a hurry and I need a comforting bowl of steaming soup to cheer up my day. 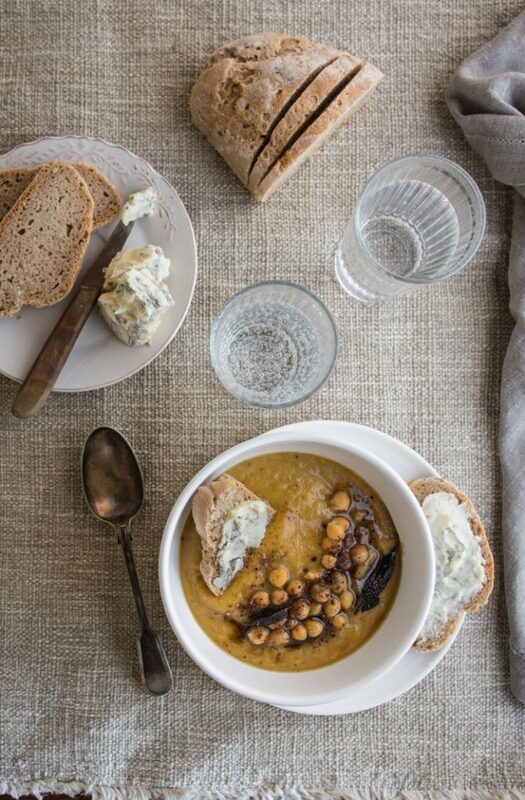 Save a few tablespoons of chickpeas to spoon over the soup, they’ll add texture and a nice decorative touch. Serve it with toasted bread smeared in blue cheese and you can call it a meal. Peel the butternut squash, cut it into pieces and collect it in a saucepan with the extra virgin olive oil and the thinly sliced leek. Cook the leeks and squash over low heat for about 25 minutes, stirring often to flavor the pumpkin and to prevent the leek from burning. Pour in the water and the chickpeas and cook for 15 more minutes, stirring occasionally, then blend everything. Season with salt and pepper and add a pinch of grated nutmeg. In a saucepan melt the butter with the sage leaves and cook until they are crisp. 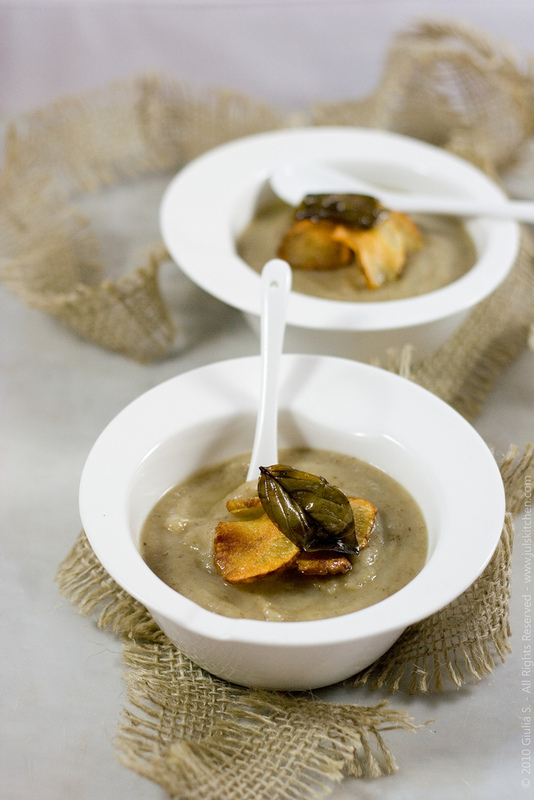 Serve the soup topped with the crisp sage leaves and drizzle with the brown butter. This is the link to follow to discover in the next weeks the recipes I developed for Amio. I have a soft spot for my friend Rossella‘s photos and recipes. I am not alone, as my sister Claudia usually chooses her recipes for a last minute dinner, her packed lunch for work and the Sunday cookie baking. We joke about it, but the truth is, I do cook Rossella’s recipes as well! 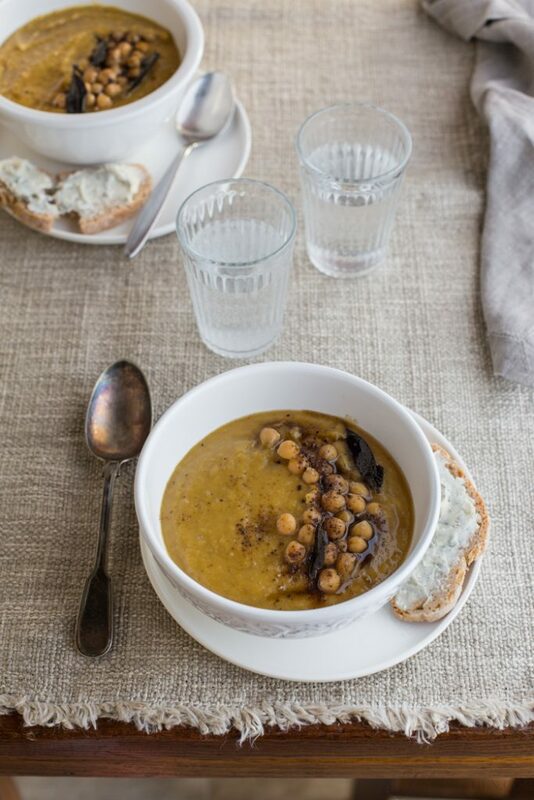 Just have a look at her cannellini bean, pumpkin and turmeric soup and you’ll understand why. My favourite podcast, BBC Radio 4 – Food Programme. Listen to the pizza episode by Don Saladino or the interesting interview with Diana Henry and you’ll understand why. Download episodes from here. FAO nominated 2016 the International Year of Pulses, here you can find more information here regarding the activities and the purposes of this decision. The IYP 2016 aims to heighten public awareness of the nutritional benefits of pulses as part of sustainable food production aimed towards food security and nutrition. The Year will create a unique opportunity to encourage connections throughout the food chain that would better utilize pulse-based proteins, further global production of pulses, better utilize crop rotations and address the challenges in the trade of pulses. My mamma could feed a multitude and still save money. I grew up eating lots of beans and not humongous portions of meat. No matter what mamma cooked, it was delicious and filling. Just the other day I posted a while chicken chili recipe. The juicy chicken is delicious but the beans are the star with a touch of lime and cilantro when the chili is served. Your soup sounds fantastic! Since you mentioned it, I’m now in the mood for Ribollita 🙂 I’m looking forward to your next recipe. Grazie, Juls! Buona giornata! I love white chicken chili. It’s the one sure way to get American kids to eat beans now a days. Thanks for the tip! Juls, wonderful post, thank you for the background information as well as the BBC 4 podcast recommendation – I have already d downloaded it. We are fortunate enough to have an outdoor forno here in Northern California and always end the evening by putting a pot of well soaked cannelloni beans in for the night. The deep, smokey flavor of the beans cannot be compared to anything else. With Fall begins my traditional soup making Sunday, to have soup on hand for the beginning of the week. I will certainly make your Chickpea and Butternut Squash Soup this weekend. I agree. I love to make soup out of what I have. Italians love soup and that is a wonderful invention (probably out of necessity in the past), both for a nutritious meal and for using up leftovers. This soup is delicious! So simple but comforting and warming. The combination would never had occurred to me, and the browned butter and sage was extra delicious. My whole family adored it tonight. I had been on the lookout for a new approach to squash soup, so thank you so much! I am newly obsessed with za’atar which I always add cumin to, so this obviously had a sprinkling over the top for a bit of a middle eastern taste. Buonissimo!